Click here to visit Spitty's blog! treats from their home city!! I'm for the Giants and the lady is for the Tigers (yes, because they're felines). I'm rooting for the Giants because King Spitty wisely pointed out my responsibilities as a ruler of California (Central). I defer to his better judgement. Oh dear... maybe it'll be a tie game and everyone will be happy! Good luck to all the teams. Have a wonderful Wednesday. Oh gosh, how are we to know who to vote for. Are there bribes available?? LOL. May the best team win. Take care. @Spitty, I'm on my way pal!! @Molly thank you!! You too!!! @Sugar you were close! It was football!! MOL!! 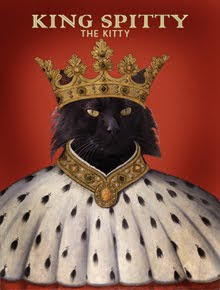 @Mr Black I understand your position..since you live by King Spitty you MUST defer to him! GO TIGERS!!! I did a World Series post today too!! Good luck to your tigers! Since I couldn't care less about baseball, I might as well root for the cat team! We hope the Tigers win. Good luck to all the teams! Yay! Hmmm, Me is not sure who to root for....They is both great teams and yous and Spitty is my great friends. Me will lets yous know tomorrow. Oh my, gonna be a rumble fur sure! Oh what a fun! Good luck to your team! Good luck on your Tigers!! the Momma only watches the brown pointy ball game, but since we're from Michigan too, we better vote for thoes Meowzer Tigers! @Nellie ever the diplomat! Love it! @Priscilla another diplomat!! MOL! Thank you! @Sue thanks...I wouldn't know cause no one ever shares me!! MOL!!!!!!!!!!!!!!! @Old Kitty you don't have to know what is going on...just keep rootin' for the Tigers MOL!! @The Island Cats we subscribe so we will be over! YAY TIGERS!! There doesn't seem to be much talk on the blogs other than fighting giants, tigers and now cardinals??? What's the pope gotta do with fighting? Tigers are cats, right? So go Tigers!!! Oh, yes, friends GO TIGERS GO TIGERS! We can't wait for the game to start already! We hope JV's pitches are all strikes and that he blows the Giants away! 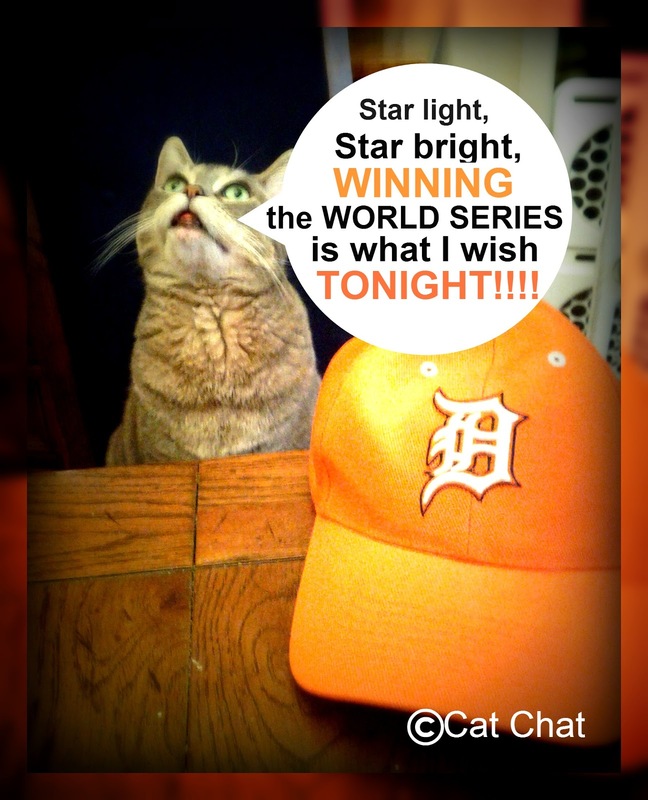 Your fellow Detroiters send you many purrs and wishes for a sweep for our Tigers. Ah yes, The World Series. Too bad the Detroit Tigers weren't playing the New York 'Mutts'! I predict whoever wins four games first, wins The World Series. Boy, we're not gonna get in the middle of this thing, other than to mention...um, TIGERS! Ummmm can we wish you both luck?! @Penny Ohhhhhh love it! will be thinking of you when I watch! This is gonna be a fun game! Best of luck. Remember the Giants are still playing and haven't gone home yet like the Yankees did before the ALCS. Your pitchers will have to field the ball and throw to the proper base. Dunno if I even want to watch. Well, 5-0 in the top of the 5th....long way to go till the 9th though! We ♥ Barry Zito! No matter what, keep your chin up, pal! Seven games is a long series! Absolutely! We are with you on this one! Nothing and no one is better than a feline. Ha! May the best team win! Good luck. If I followed baseball I would cheer with you. ...and a little cat treat too! Wagging Wordless Wednesday! Cats and baseball - life is good!